Da Capo Press, 9780306821486, 496pp. 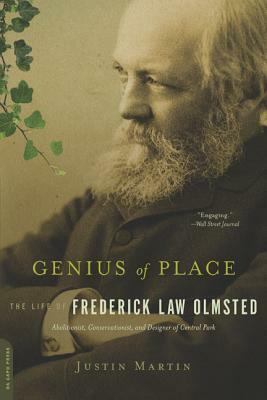 Frederick Law Olmsted is arguably the most important historical figure that the average American knows the least about. Best remembered for his landscape architecture, from New York's Central Park to Boston's Emerald Necklace to Stanford University's campus, Olmsted was also an influential journalist, early voice for the environment, and abolitionist credited with helping dissuade England from joining the South in the Civil War. This momentous career was shadowed by a tragic personal life, also fully portrayed here.Most of all, he was a social reformer. He didn't simply create places that were beautiful in the abstract. An awesome and timeless intent stands behind Olmsted's designs, allowing his work to survive to the present day. With our urgent need to revitalize cities and a widespread yearning for green space, his work is more relevant now than it was during his lifetime. Justin Martin restores Olmsted to his rightful place in the pantheon of great Americans. Justin Martin is the author of five books, including Greenspan: The Man Behind Money, Nader: Crusader, Spoiler, Icon, and more recently A Fierce Glory: Antietam--The Desperate Battle That Saved Lincoln and Doomed Slavery. Martin lives with his wife and twin sons in Forest Hills Gardens, New York.